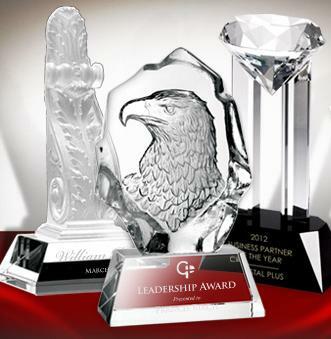 When looking for crystal awards to give to employees, winners, or other recipients, it helps to know the different types of materials available to add a unique characteristic to your customized plaques or trophies. Some of these types of materials include optical crystal, pâte de verre, and lead crystal. Also used in camera lenses, NASA telescopes, and high-end visual equipment, optical crystal products are clear and flawless. They are manufactured in large sheets of molten material. Before they harden, they’re pressed under great pressure to eliminate bubbles or distortions. Optical crystal awards contain no lead, making them extremely hard. Because of this characteristic, they are easy to polish for a smooth and flawless surface. They’re also easy to cut and bevel. Characterized by its unique translucent texture, pâte de verre is achieved through the “lost-wax” technique. It is a time-consuming and complex process that requires in-depth expertise and craftsmanship to produce a true work of art. Used by ancient Egyptians and revived by some French artists later, pâte de verre gives emphasis on intricate and bas relief details. To further stress its unique features, this material is often used with optical crystal to create designs that play with contrast. Traditionally, sparkling crystal was made with high levels of lead. Today, lead crystal still contains the metal, but at a more limited amount. By adding a carefully controlled amount of lead or lead oxide, the material gains weight, hardness, and color. Lead content even enriches the brightness of crystal and makes it sparkle and more brilliant. Crystal products with lead content are even treasured for their artistic value, which increases with time. In its raw form, lead crystal is soft. This can make them easier to pour into molds to achieve a sculptural effect for awards. Because of its softness, lead crystal is also easy to cut and bevel with edges.